Time for yet another WordPress update; get WordPress 2.6 here. In the world of software updates, “just do it” works. And with WordPress, if you are the type of webmaster who delays software updates for when you have “free time,” you will find yourself behind by a couple of software versions in no time. Besides, the obsessive updating of WordPress’ code means WordPress is the best and most advanced blog software available – millions of supporters and users looking for possible vulnerabilies in the code, and hundreds of developers attending to it. WordPress is, and will always be, the only way. Seems as though I am directing this post to a non-Wordpress user. Maybe, maybe not. As said in my previous post, and like my statistics reporting, my monthly income reporting was stopped last October 2007. The first from last year’s series was a report on August 2007’s income. It then lasted only three months. Nobody gave a fudge as usual – who would care about a $20 income from a blog anyway? But it helped me and it meant something to me. It felt like I was achieving something more every month, no matter how small. Now, I will give it another try. And like what I realized in my previous post, I stopped increasing my earnings when I stopped pressuring myself from reporting about it every month. This can also serve as a gauge for other bloggers, especially if combined with my traffic figures. But, I will however explain in the end how I don’t care that much for this blog’s earnings. Last year I had three income streams for this blog – AdSense, Amazon Affiliates, and Text Links Ads. Now, eight months later, I still only have three. I kept promising to myself to add more income streams, but the will ended when the reporting ended. Anyway for June 2008, my income for this blog is as follows: $32.14 from Google AdSense, $22.89 from Text Link Ads and $1.70 from Amazon Affiliates. Which brings us to a whopping grand total of $56.73. Again, I’m right where I left off – $54.13 last October 2007. I guess I just want to get rid of typical me for once – he who never finishes what he started – plus, I feel that I’m slowly letting this blog slip away from growing. I barely post nowadays, even if I lowered my monthly post quota to ten. When I did this monthly reporting last year, even though it felt like I was talking to myself, I felt happy and content. I felt like I achieved something every month, and I did, and I learned a lot. You might think $56.73 a month from a blog is a waste of time. To tell you the truth, it is. With my traffic, bloggers can earn twice to thrice $56.73 easily. How? First off, by optimizing ad positions and adding more income streams. All of which I do know, but have chosen not to apply to this blog. Why? Because this blog is my playground, this blog is the “concept car” while my other sites are the ones in production. I learn a lot from doing small experiments here, and I’d like it to stay that way. Last year I started reporting my blog’s monthly traffic statistics and income regularly, ala John Chow, and for some unknown reason in November, I stopped. I wouldn’t say it was because nobody gave a fudge about it (it’s true), because I did it for myself. I did it because it was challenging – to raise my statistics and income every month. And it worked. From when I started doing it in May last year up to October, my traffic raised by a couple of hundred (daily average) visits every month. Last June, my blog had 26,337 unique visitors, which means I’m just about right (lower, actually) where I left off – 29,587 in October 2007. I had a total of 40,127 visits – again lower than October last year, and served a total 112,532 pages. I ate up 12.35 GB of bandwidth, from an average of 1,337.57 visits per day. Google gave me 9,249 referrals, and Yahoo!, 2,063. These statistics are based from AwStats, as always, so if you want the Google Analytics equivalent, subtract around 15%. 8 months after, I ruined my blog’s increasing numbers and actually went lower. Although I wouldn’t exactly say I am doing worse now – my blog has more pages than ever, therefore more keywords, but I can safely say I stopped my blog from growing. From this month on, I plan to raise traffic regularly by pressuring myself to want something to report better than the last – even if it means only a couple hundred visits more. I ruined it. But it’s not too late. By the way, my traffic record stands at 39,119 in November last year, but I admit it was a fluke. Because back then, even my name was being googled. My record for most visits in a day was in October 25 last year at 3,411. Again not counted, because people still visited “BB” back then, which led them here. Here are the rest of this year’s statistics for your curiousitiy. See you next month with more traffic. Next post will be on last month’s income. Get ready to be bored. My money finally came through today even if I used the wrong bank code supplied by BPI last Monday. But, it had a deduction of Php 150. My Php 12,571.74 became Php 12,421.74. PayPal states that Php 250 will be charged if wrong bank details are supplied, I wonder why mine was deducted Php 150 only. Puzzler. The BPI bank code posted below was given to me by BPI’s customer service last Monday, before Paypal released it’s official bank codes list. I withdrew using the code below. I have not received my money in my BPI account, nor has PayPal returned my money with the said Php 250 deduction fee if banks details are wrong. I will update this post if PayPal will penalize me. The new “official” BPI code is 010040018. Philippine-PayPal account holders now have the option to withdraw through local banks, and so the title says. I will credit pinoymoneytalk.com on this, just because they bitched about it, but I did honestly read it first from mukamo.com. To make this post short and swabe, simply log-in to your PayPal account and go to Withdraw. You will need to enter your bank account number, and your bank’s 9-digit code. Call your bank’s customer service to find out your bank code – it is not the same as the swift code, obviously, because that’s an 8-digit code. BPI account holders, save some time and use this code: 021000021. Withdrawing through local banks is free if you withdraw a minimum of Php 7,000.00. By the way, your account must be a Peso account. I withdrew $300 before this post and they gave me a 1 U.S. Dollar = 40.6800 Peso exchange rate. My PayPal account has already been deducted, even if the promised delivery time is 5-7 business days. Maybe in 5-7 business days I’ll update this post. I’ve been contacted by AdBrite support. Apparently, they came across this blog post as well. Yes, they do reply, just not as fast others but they won’t leave your queries unanswered. They are investigating if the check has been cashed. Just waiting now for they will eventually figure out. Holy matrimony, Batman, I don’t want to go through this whole thing once again. I’m now two months late. Thing is, I don’t quite remember if AdBrite checks come in via registered mail. Unfortunately, there is no other payment option in AdBrite. They do, however, come in like clockwork on the the second week of every month. I have already written to AdBrite support (they’re not the best), and still waiting if the checks have been cashed somewhere. Wait, my CPX Interactive check is also about a month and a half late. Crap, crap, crap! Please, oh please. This led me to thinking – if I had a corporate bank account, and checks are payable to said company name, would it be harder for a check thief to encash it? Better late than never part two. I do monthly income reporting for this blog on the second of every month, so this is for October – which was supposed to have been posted last November 2. The goal – to increase income for Thoughts In Binary every month. So far, $21.13 last August, and $35.54 last September. I have been bragging about adding more income streams for this blog, optimizing my layout for ads, etc. So far, last month, still found no time to do such things. Last October I earned $37.89 from Google AdSense, $13.99 from Amazon Associates, and $2.25 from Text Link Ads. Grand total = $54.13. Ideally, I should be earning around $150, given an ideal but attainable CPM from my blog’s statistics. I’m still using the default WordPress template which is not really optimized for ads. Still can’t find the time to look for, or code, a new template, but I do what I want on this personal playground. But hey, did you know that some paid-daily-to-blog people get as low as Php 3,000 a month? I got around Php 2,200 for 15 posts last October. Not bad, maybe. Better late than never. Here’s my blog’s statistics for the month of October. I do this monthly on the first of every month but unfortunately, November didn’t really start ideally. Last September, my blog experienced it’s second only ever monthly decrease in statistics. This month, I’m happy to say that my blog is back on track – increase traffic every month, and I’ve also surpassed the last record which was on August. September saw a whopping 29,587 absolute unique visitors. Almost 10,000 more than my record-breaking August 2007 statistics. I also nearly doubled my number of visits at 46,721. My blog server 107,247 page views at 14.89 GB of bandwidth. Average daily visits ended at 1,507.13 per day. 6,727 referrals came from Google, a whopping 7,017 from Google Images (wow, never really thought how keyword-rich my gallery is) and 1,746 from Yahoo! To tell you the truth, I used some (wasted) resources to produce these numbers last month. My original goal (on posting statistics) was to see how much I can manually increase my blog traffic without utilizing my network’s resources. I did a little experiment last October and this is what I’ve come up with. I can easily double these stats if I abuse my resources even more; but, that wouldn’t help in my journey to understand blogging and search engines. I have less time experimenting nowadays, so I couldn’t possibly keep up with increasing my traffic (quality) monthly. Maybe I won’t do this next month. This is only the second monthly income report for Thoughts In Binary. This income report is for this blog alone. I started doing this because the public pressure might motivate me further to increase my income every month; that and because these posts are what I enjoy reading the most among the more popular dot com gurus’ blogs like John Chow’s. My mission to top August’s earnings ended when I figured there were more days in September to begin with (I started monetizing mid-August). When I said that, I was only half-kidding, but then again, too many unfortunate events happened last September. I was not able to add other monetization mediums like what I had planned. I am still using (only) Google AdSense and Amazon’s Affiliate Program. I earned $33.75 from AdSense and $1.79 from Amazon. Obviously, my total monthly income for September is a whopping $35.54. Now I can start a family. If I have more time to think freely this month, I’ll work on improving my blog’s income – optimize AdSense, add more affiliate links, and add more monetization mediums. However, I still have to deal with a lot of things so I’m not expecting much. Do realize however that this measly income is from this blog alone. Who’s to say that I don’t have another 20 more of these (blogs). Well, I don’t. At least I increased my August to September income and like I said, my only goal is to increase every month. If it’s by a $1, I’m happy. 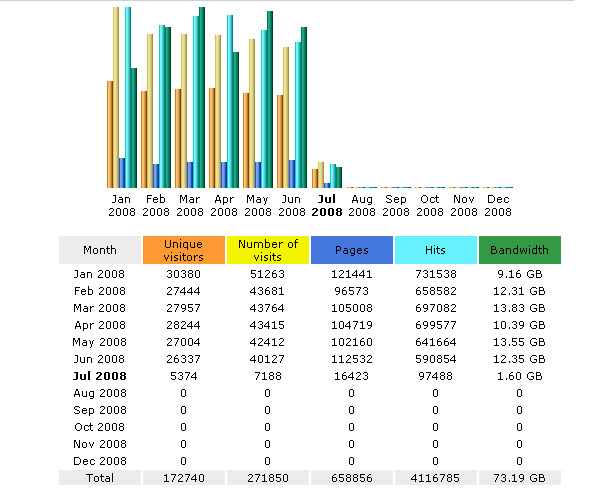 Here are my blog’s statistics for the month of September, 2007. Notice that I just did my August 2007 reporting seven posts ago. Well, obviously, a lot of things happened last September and I was only able to update my blog seven times. It is however interesting to see that this low post count affected my blog’s traffic by an acceptable amount. I do this statistics reporting every month and my goal is to increase traffic monthly with no specifics on how much. I have increased my traffic monthly by a substantial amount since June. Last September I experienced a slight decrease in the total number of unique visitors. I had 19,455 unique visitors – 358 visitors shy of August’s record-breaking 19,813. But, I received a total of 28,769 visits – only 27,863 in August. My blog served 67,067 page views at 7.60 GB of bandwidth. And, I also set a new daily record of 1,295 visits (1,042 previous) on September 20, while my daily visitors average increased to 958.97. I received 7,278 referrals from Google and 1,259 from Yahoo! This month only my monthly total unique visitors and my Google referrals dropped. Honestly, I am very happy with this month’s results granted that I was only able to post 7 times last September – this explains the Google drop. And, I only lost 358 unique visitors – which means repeat visitors are increasing. In addition to that, some of my blog’s posts are seasonal. Some of the traffic-generating posts expired. I think to top last month’s traffic I should be able to capitalize on another about-to-happen big event, which is by far my biggest worry since I can’t really dictate what’s in store for us this month which is related to my blog’s content. Tomorrow, my income report for Thoughts In Binary ; I’ll be the first to say, it’s boring. This is the first of my planned monthly income reporting. From here on after, every 2nd of the month, I will give a detailed report of my blog’s income from the previous month. It will come after my blog’s statistics report, so you will have an idea of how traffic and income relates to each other. When I started this blog I said my goal was to earn from blogging. 3 more personal blogs and a near-dead blog network after, I’ve come to accept this blog more as a personal extension of my private life and weird thoughts. I am still an internet marketer by profession though, so you might still learn a thing or two from me from these posts. Like my traffic goal, my income goal is simple – increase income every month. It does not matter if I increase my income every month by a dollar, as long as I increase it monthly, I’m happy. Like I’ve said before, I will only start to place ads on this blog after I reach 1,000 daily visits. Luckily, that happened last August 9. Since then, I’ve only used Google AdSense and Amazon’s affiliate program. I earned a measly grand total of $20.51 from Google AdSense and $0.62 from Amazon. That’s a grand total of $21.13 for August. My, oh my, I’m on my way to becoming a dot com mogul. For September I’m confident that my income will increase mainly because there are more days (monetization) in September – I only placed ads on the 9th of August. So ah, my work is done. Okay, let’s add a little more excitement here, after all, my blog’s traffic is 1/6th of John Chow’s so in theory I should be earning around $3,000 of John Chow’s $17,828.61. Now how to get that done will be the mystery of my blogging career. I will try to add as many monetization mediums to this blog but it’s already not looking good. This blog has already been unaccepted in TLA and yesasia.com. Har, har.